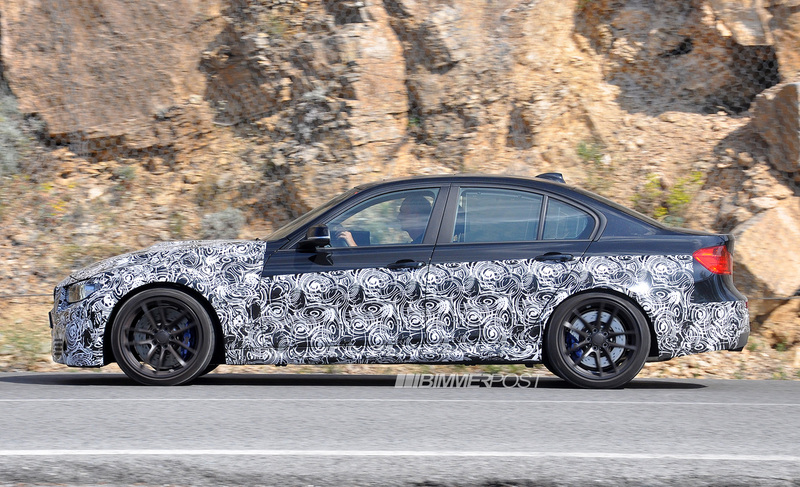 Spied: 2014 F80 M3 Sedan Gets Power Dome (Hood Bulge)! 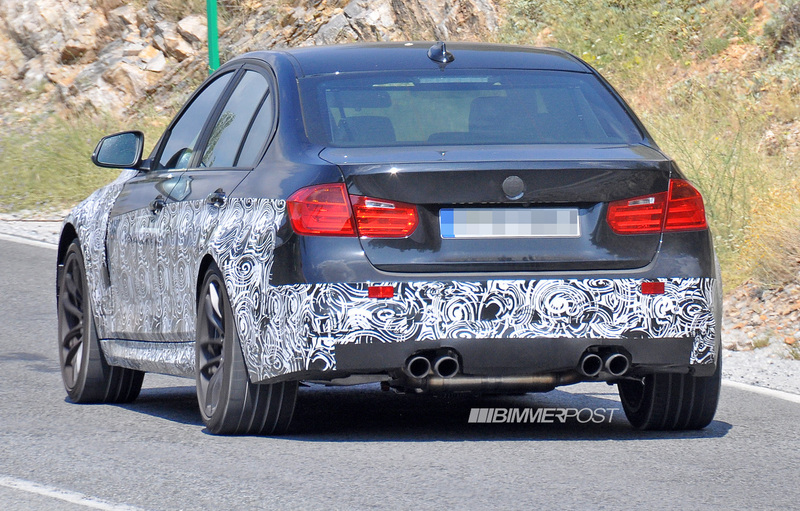 We've just spied this afternoon this F80 M3 sedan prototype showing a power dome / hood bulge for the first time. 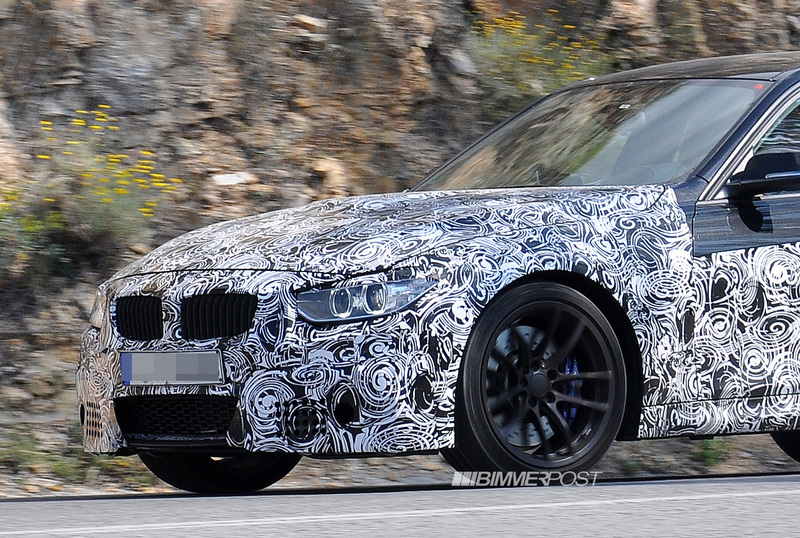 The M3 may have now entered the FEP (Final Evaluation Phase) stage of testing. 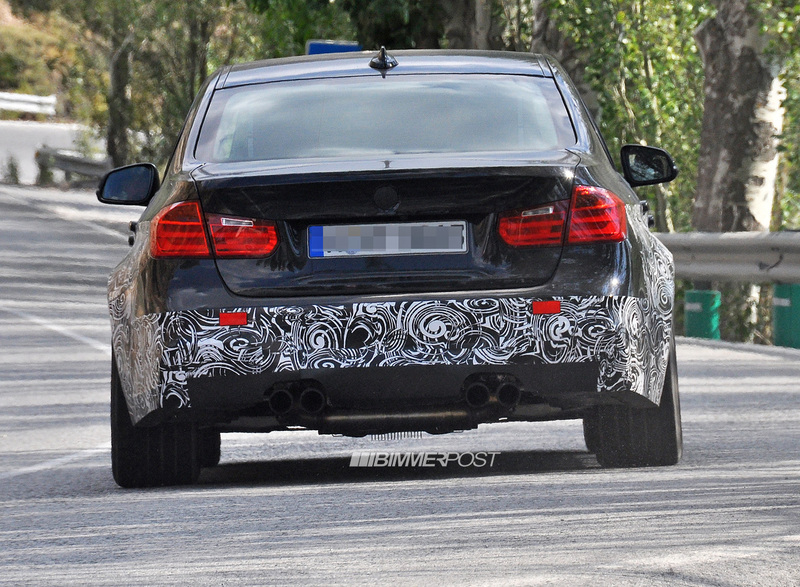 Until now some M enthusiasts have been disappointed to see the lack of a power dome on previous prototypes, but this mule confirms that the F80 M3 and F82 M4 will feature an aggressively shaped hood. We think that there is a possibility that the hood lip/bulge could feature a heat extractor vent to ventilate the engine compartment as well as enhancing the sounds coming from the engine. See our analysis. The rest of the camouflage remains as concealing as on prior mules. 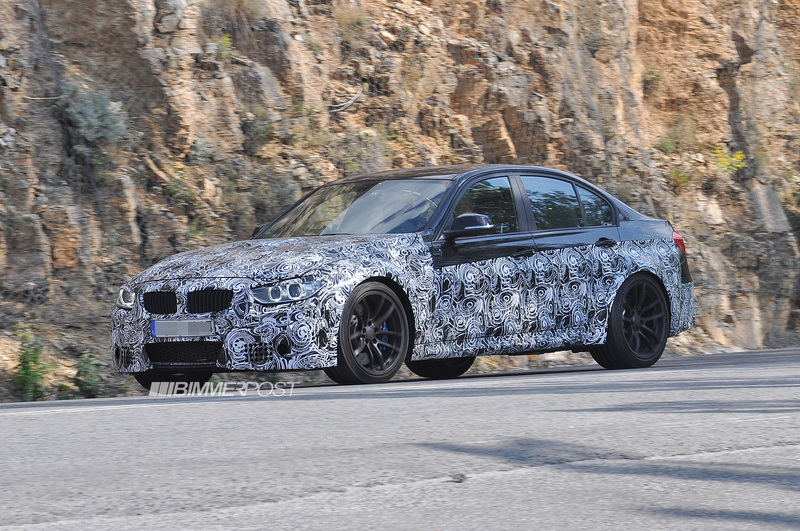 As seen clearly, the M3 kidney grilles are sportier than the F30 3 Series, yet not as thin nor wide as the recently exposed F82 M4 coupe grilles (pictured below for comparison). 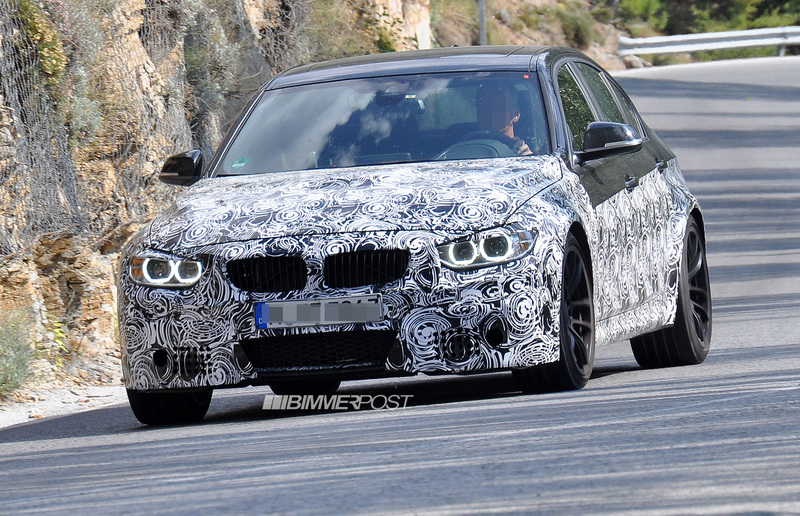 The headlights underneath the camo may (unconfirmed) also be a sleeker version of the F30 headlights, although they will join the headlights like the F30. The sideskirts are also different than on previous mules, now with an upswoop at its end. 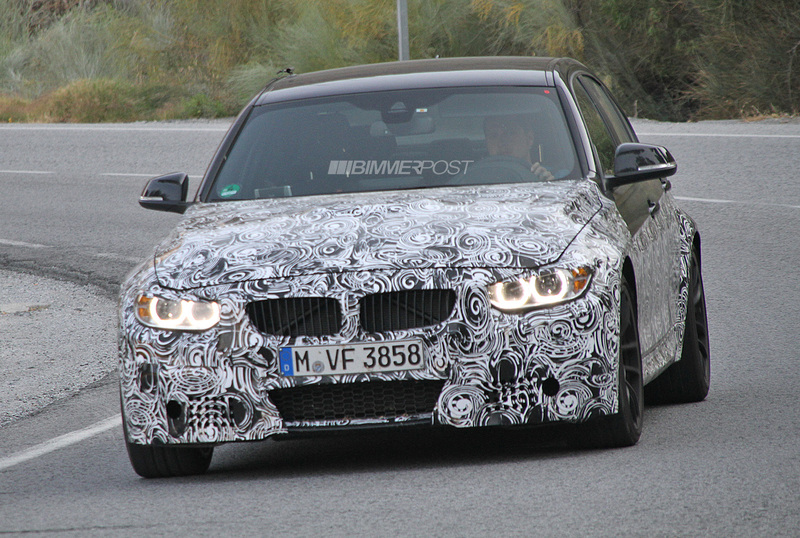 The side shots of the prototype show that the headlights will appear to be more recessed as a result of the beefy front bumper extending out further than on the F30 (think of the 1M headlight-bumper compared to the standard 1 Series). The production side view mirrors (which also be sportier in shape) have not yet been installed on any prototypes. 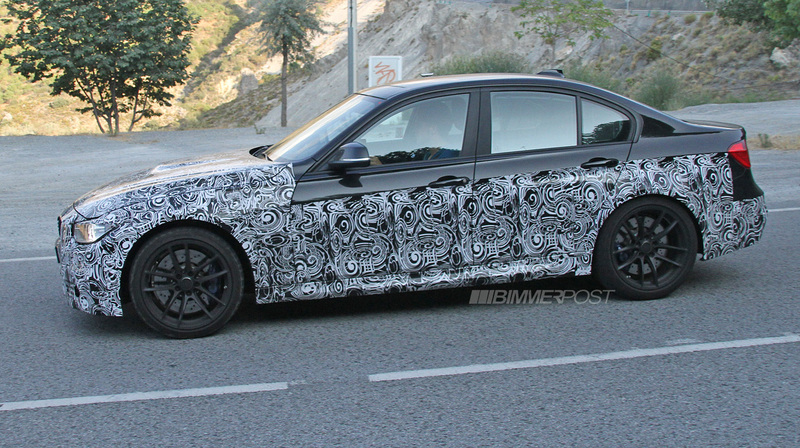 All in all, the appearance of a power dome, together with the super flared wheel arches and still-covered M body styling, is shaping the F80 M3 to be an aggressive looking sports sedan! 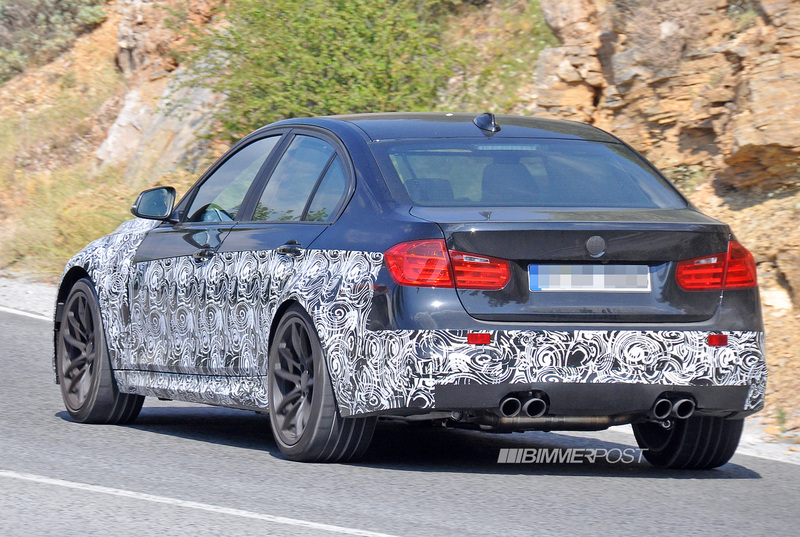 The F80 M3 / F82 M4 will be powered by an inline 6 cylinder engine with multiple turbochargers, pushing approximately 450 horsepower. The engine has been rumored to be an extensively reworked and reinforced N55 6-cylinder engine with a strengthened aluminium block with a heavily modified cylinder head. The Induction technology is said to be completely new as will be the latest bi-vanos variable valve timing. 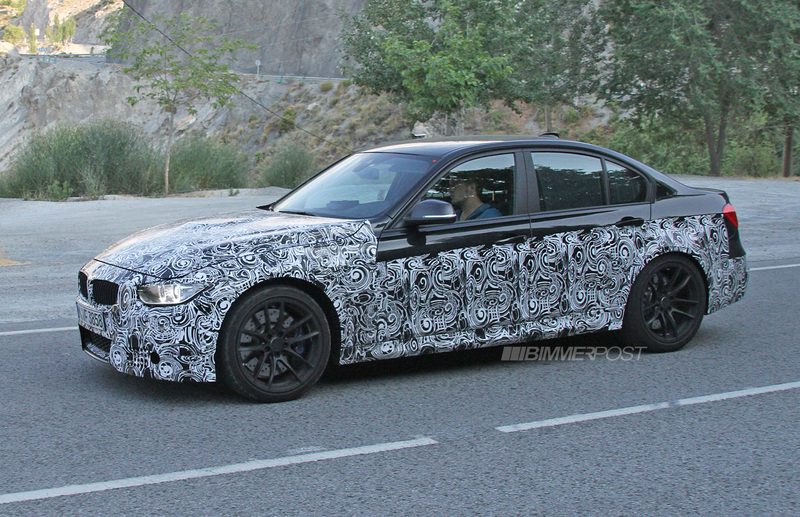 But, we also think there may be a possibility that the engine turns out to be a reworked/enhanced version of a successor engine to the N55 (which has not yet been introduced). Both a DCT and manual transmission will be available. The blue brakes resemble the new 3 Series' M Sport brakes, paired with steel cross drilled rotors. 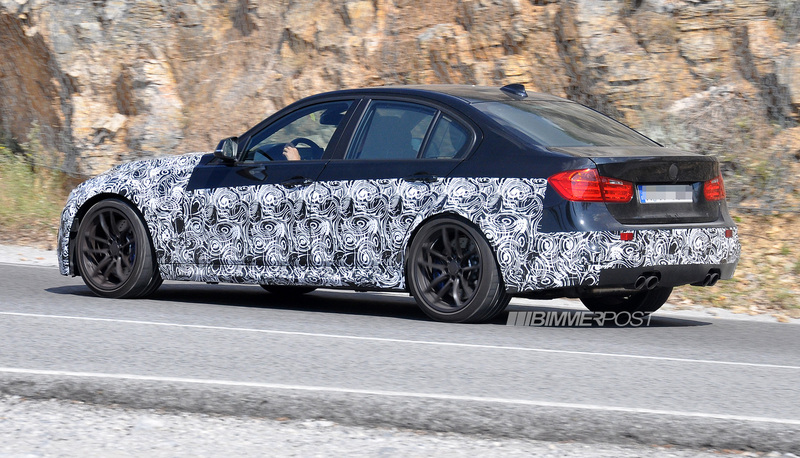 In case you missed last week's exciting video of the M4 coupe, we've posted it below, along with the M3 sedan's last sighting on video. Loving the aggressive rear profile! NICE!!! I want the M4 now! I think the sedan is going to be the looker this generation. The car looks to be coming along nicely. My M4 fundraising starts now. This vehicle is shaping up nice. It does seem to look more aggressive than the coupe. 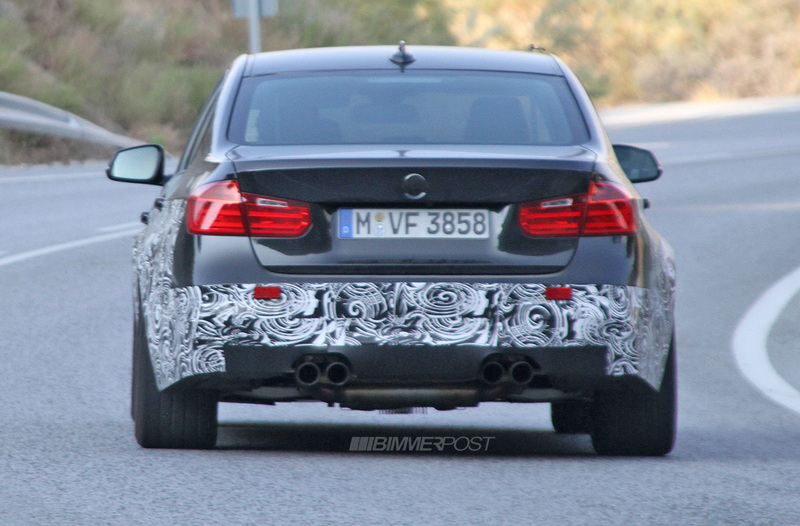 However, the exhaust seems to be looking very small, meaning the can between the pipes. They went back to yellow halos? Photos are often deceiving when it comes to color of halos (how white or yellow). It's hard to get a true-to-life image sometimes. Incorrect white balance given the conditions can always play a factor. Just look at some of the different photos within this newest set. There's even variations among them - looks yellowish in the head on shot, but whitish in the profile close up photo. 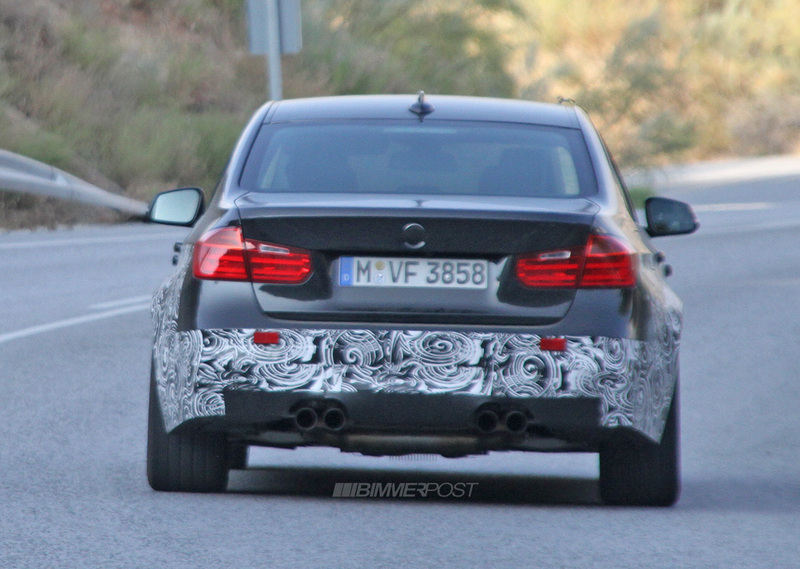 Based on rear shots, the car has the E9x suspension components. I have mixed feelings about this. On the one hand, I think the hood bulge fits the car's sporty character, makes it look more aggressive than without, and offers some additional sheet metal differences from its F30 sibling. On the other, I'm a firm believer in form following function wherever possible, and unless BMW shoved a new engine under that bonnet over the weekend, it looks like the hood bulge is purely aesthetic, which is a bit... sad. I'm one of the guys who love the power Dom (I know not all of you agree) wether on the E46 or E9x and I was very disappointed not to see it on the coming M3 & M4. Now that I see it, I don't know how to react. I still love the look but knowing that it has no function or serves no purpose is leaving an after-taste, bitter one! I love M3 4-door in the past, but this time around, I am not pursuing anymore. Is that a bulge, or are you just happy to see it! Love the power dome!! Still not sure about the front lights. I like the look of the power dome, and suspect if it is there it is because it is needed. I wonder if there is any possibility that the bonnet on this car is meant to deceive as to what the final design is.